As picturesque Disneyworld looms just out of reach over a Florida welfare assisted motel, so too does the prospect of any normal upbringing for some of it’s pint sized residents. Sean Baker’s The Florida Project exists in a world of pristine pastel promises and lacquered, castle shaped buildings, a colourful, cotton candy paradise that is as tragic as it is eye catching. For six year old Mooney (Brooklyn Prince instills joy and heartbreak in every mannerism) and her friends, this is a kingdom where they run wild, oblivious to the squalor around them and perceiving their surroundings through the idyllic, abstract lens of childhood. Mooney’s mother Haley (Bria Vinaite in a scarily realistic depiction of unabashed ratchetness) is a wayward, self destructive girl whose slack, near non existent parenting leaves the girl mostly up to her own devices. Haley loves her, that much is clear, she just isn’t built to take care of herself, let alone a daughter. None of this strife matters to the children though, and that’s where Baker’s film gets its light from, amongst such troubling themes. All of it is seen through their eyes, youngsters who are still half connected to the subconscious and therefore are affected differently by everything. Peter Travers has called this ‘the best film about childhood ever’, and he may just be right. Much of what we see shows them simply playing, running about and being kids in a naturalistic, unforced way that is enchanting and makes me endlessly fascinated about Baker’s methods of direction, as I imagine children are harder to control on set than animals. To say that music is used sparingly here would be an understatement; ninety percent of the film is soundtrack free except an ironic opening credit sequence set to ‘Celebrate Good Times’, and one jarring musical cue near the end that I won’t spoil except to say it’s so effective I let out an audible exhale of surprise. The film is episodic too, and although contains visible arcs, is told in a hazy, spare and hypnotic ‘fade in, fade out’ fashion, drummed into us until we feel the day to day rhythm of this curious and beguiling part of America. Now let’s talk acting, which, as you all know is the centrepiece of my cinematic musings. Willem Dafoe is a tower of power as stern but compassionate Bobby, motel manager and guardian angel to this group of lost souls. Dafoe is a seasoned pro and knows never to overplay it, and when things get rough for him to bear witness, his moments of quiet devastation are incredible. He’s also the comic relief in bits and the steward of a very irregular township, it’s a delicious role for any actor to get, and he’s about long overdue for an Oscar, so… hint, hint. Prince is an unbelievable find, showing uncanny control and focus on camera for someone her age, and when it’s time for the third act emotional beat-down, she hits every note pitch perfect. Vinaite seems to have no acting experience before this, a choice which Baker also went with in his fiery debut Tangerine from a couple years back. She’s great too, turning a role that could have been one note into something way more complicated and sad, like a tragic fallen angel. I’d also toss cinematographer Alexis Zabe’s name into the Oscar race, as she beautifully captures this really strange looking area in surreal, eye popping colour and always from angles the seem like a child’s POV a la Terry Gilliam. Between his debut and now this, Baker is gathering momentum in leaps and bounds, and he’s quietly released the best film of the year so far, no easy task in the same year as a certain SciFi masterpiece. 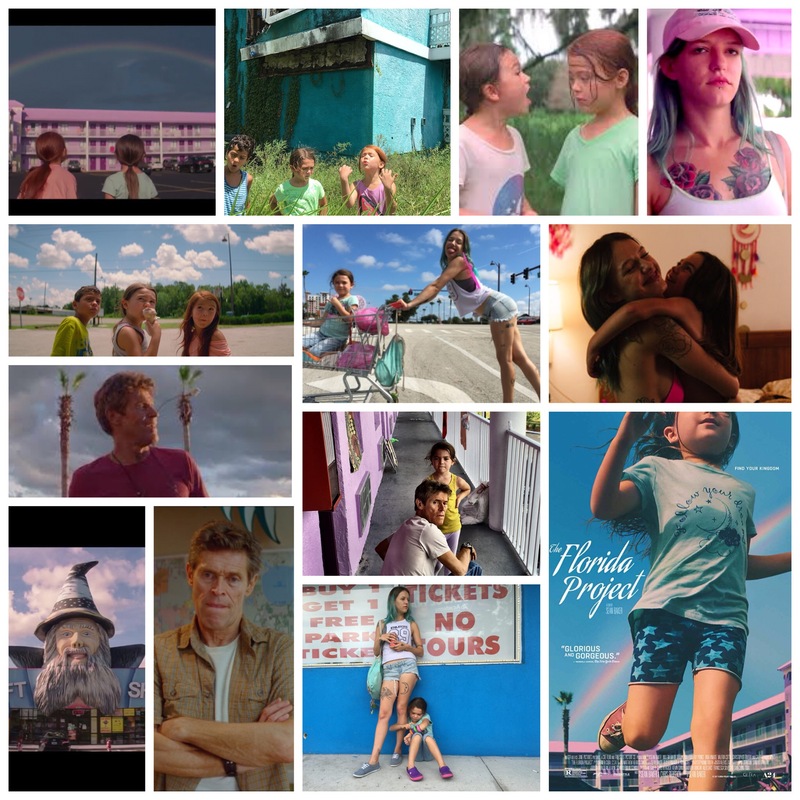 Florida Project is intimate, focused, loosely spun yet gravely affecting, important, playful, both cinematic and anti cinematic, and something of a small miracle. Seek it out in theatres, even if you have to drive out to the local art house venue.